Without ruffles and frills, the simplest builds are usually the most appreciated in Cycladic architecture. With plain constructive elements, the locals built their homes to cover their daily needs, meaning mainly to be protected from the lusty winds and the strong sunlight. The Writer’s home & Guest-home is a well-appointed feature of the pleasingly simple Cycladic Architecture. Unpretentious and modest but beautifully detailed in its celebration of its unique position, using the best and most handsome of local materials. It provides the residents with a 130-square-meters build separated in two units and it features no less than four independent courtyards which are introduced so as to ensure the residents enjoy the nature outdoors throughout days and evenings. 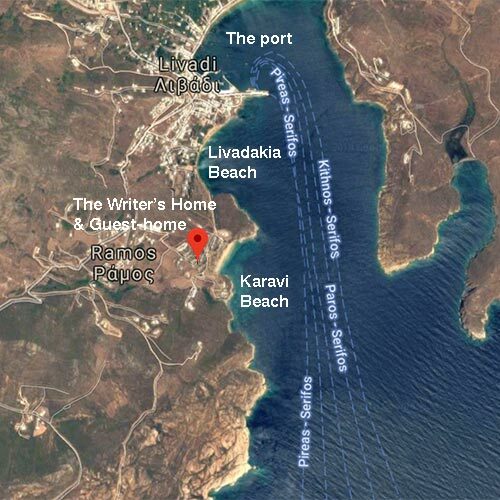 “Everyone, without a single exception, had a great laugh with my desire to build a small, stone built home and a detached guest-home in Serifos during early 1990s since brick is the easiest material for modern constructions. But it has happened as hoped. It was built by local artisans; with local stone. It was characterized as a prototype house for Cyclades and it was a low budget story that needed much tenacity and loads of personal labor. It has been more than 50 years since a stone house got built on the island, which is a rock in its entity. Since then the mockery stopped, gradually many stone houses got built on the island, with local stones or with stones coming from the neighbouring islands; all Cyclades islands are rocks; the stone was and will be there; it was with stone that people used to built their homes and enjoy all the privileges offered by a stone house, cool in the summer, warm during winter”. Vici Theodoropoulou, My darling Serifos, from the municipality’s book, 2012.